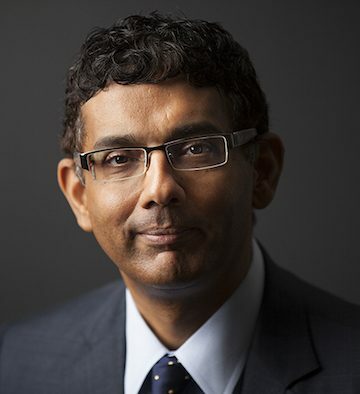 Dinesh D’Souza is a bestselling author and filmmaker. Born in Mumbai, India, D’Souza moved to the United States to attend school on a Rotary Scholarship. Following graduation from Dartmouth University, he went on to work in the Reagan White House as a policy analyst. D’Souza has served as the John M. Olin Fellow at the American Enterprise Institute and the Robert and Karen Rishwain Fellow at Stanford University. D’Souza served as president of The King’s College in New York City from 2010 to 2012. D’Souza has won numerous awards including “Best Documentary” for America (The Dove Foundation), and he has been called one of the “top young public-policy makers in the country” by Investor’s Business Daily. His films, 2016: Obama’s America and America: Imagine A World Without Her, are respectively the #2 and #6 highest political documentaries of all time. D’Souza’s latest feature-length film, Hillary’s America quickly joined his first two films in the top 10 political documentaries of all time. As the author of over 15 nationally renowned books—many of them #1 New York Times bestsellers—D’Souza has been invited to speak to groups all over the country on politics, philosophy, and Christianity. His razor-sharp wit and entertaining style have allowed him to participate in highly-publicized debates about politics and Christianity with some of the most famous atheists and leftists of our time, including Christopher Hitchens, Bill Ayers, and others. One of D’Souza’s favorite venues for debates and speeches has always been college campuses. During the past 25 years, he has appeared at hundreds of colleges and universities and spoken with hundreds of thousands of students in these live settings. D’Souza has been named one of America’s most influential conservative thinkers by the New York Times Magazine. The World Affairs Council lists him as one of the nation’s 500 leading authorities on international issues, and Newsweek cited him as one of the country’s most prominent Asian-Americans. D’Souza’s articles have appeared in virtually every major magazine and newspaper, including the New York Times, Wall Street Journal, The Atlantic Monthly, Vanity Fair, New Republic, Forbes, and National Review. He has appeared on numerous television programs, including Tucker Carlson Tonight, Real Time with Bill Maher, Hannity, The Today Show, Nightline, The News Hour on PBS, NPR’s All Things Considered, and The Glenn Beck Program. The Great SITC Debate: Is God the Source of Morality?